Why not block off spaces in current and future city-owned parking decks for bicycles and scooters. Alexander Square has that area between entrances that is perfect for bicycle and motorcycle/scooter parking if they would just install the proper racks. This would save you and I, Joe and Jane taxpayers, about $1 million in land acquisition fees and solve the bicycle parking problem. Great post Leo. During RWO I locked my bike up to a street sign where 4 others joined it. When I came back later to retrieve it my bike was laying on the ground, chain fallen off. I don’t think I have EVER locked my bike up to a rack. It’s always a phone pole, tree, or street sign. Even better would be some more artistic racks like I have seen around on the internet. Art + Function = Win! I agree that space inside the parking decks would be easy. I know some of them already have this – I just don’t use them, so I can’t say which ones. This seems like the best option for commuters who do not have in-office parking. For business patrons though, on-street/sidewalk parking would be much more convenient. Small racks could be scattered at frequent intervals all over downtown for relatively little money. This would go further towards encouraging cycling as it would allow people to lock up at their destination. Downtown is easily the easiest place to get people riding. I believe the citizens and businesses would benefit from the atmosphere cycling creates. As long as we’re wishing… how about mandated bike parking at all businesses city-wide? We mandate more parking spaces than are ever needed, yet rarely can a bike rack be found. Love the idea of a block of land for biker riders/commuters!! Could you imagine a plaza at this intersection with 50 bike racks and maybe even a juice bar/coffee/deli on the bottom floor of the bank facing the area for a quick in/out before work? 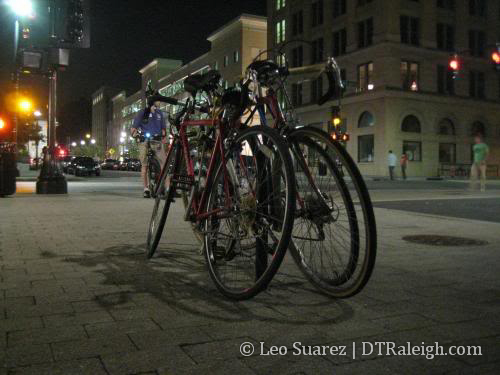 I could see this as a hub of activity from 9 to 5 and maybe a pickup spot for nightime goers with the raleigh rickshaw. DC has recently started the SmartBike program (https://www.smartbikedc.com/program_information.asp) which I think could also work in the easily bikable (relatively flat) Raleigh downtown. i couldn’t agree with you more. i just moved to raleigh about a month ago and had plans of commuting by bike down to fayetteville st. up until last week i had been riding without too many problems, although the lack of parking and the abundance of “bike patrol” who only ride on sidewalks creates the sense of a bizarro world. i am glad to see pedicabs out though and i have seen a fair number of bikers. it also occurs to me that downtown raleigh is accidentally “bike friendly” and has a lot of potential- especially if you’re coming into downtown from the west. because of the railroad tracks coming into the warehouse side of town and only a few bridges, the geography works out to where cars tend to funnel into downtown from either western blvd. to the south or come down from the north. what ends up happening is that there’s a fairly straight forward and traffic-free ride coming in from streets like hargett (if you can get over there; i recommend taking boylan down to it). that said, i also feel like the absence of bike racks is tied to a larger lack of awareness/visibility. my bike is currently out of commission because i was hit by a car last week. the car was turning left while i was biking straight through an intersection downtown. completely the driver’s fault– her excuse: she was trying to beat the truck behind me and didn’t even see me as she turned into me. she’s fine and i’ll be fine, but the point is that when we don’t even have a place to park our bikes downtown then how are the non-bikers ever going to be aware of us? i have high hopes though. 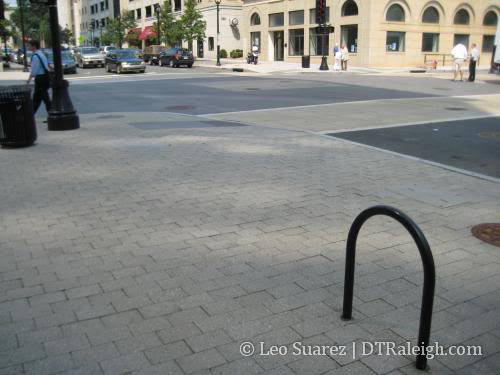 from what i’m told raleigh just keeps improving and i imagine a place to park our bikes is a part of that. I *don’t* like the aesthetics of seeing a bike tied to a tree every couple of blocks, so I’d be in full support of centralized bike, scooter and motorcycle parking areas. I’m too lazy to do internet research today, but does anyone know how the bike-friendly cities of east Asia (Saigon, Beijing, etc.) handle all the parking needs? Kind of like the aesthetic of having the streets lined with cars? If you wanted to keep the sidewalks clean, you could always install racks in some of the parking spaces – which could actually be a more efficient use of the space. Putting racks in the on-street parking areas would definitely be a more efficient use of the space. I think the racks would have to be removable for events but that is really a non-issue. I’ve been thinking about converting car parking deck areas into bike/scooter only parking. It is a really good idea because of the very small cost to convert some space but one point that may turn people off on using it is that feeling that you are still within a car-dominated realm. A bike only area gives off the feeling that its just that, for bikes ONLY, no cars allowed. So I think this would be used much more as well as make a larger statement by the city in their support of biking and alternative commuting. Yay, that’s my scooter! 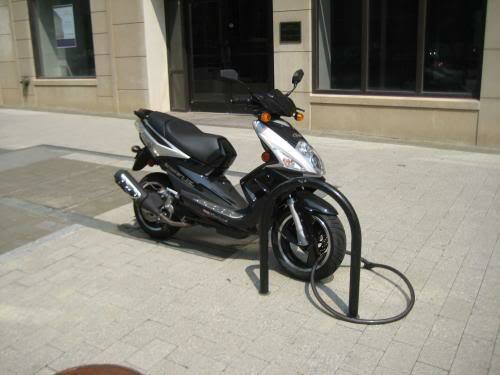 To my cyclist friends – sorry I’ve been hogging the rack at Hargett/Fayetteville, but it sure beats $10/day parking + gas!! In all seriousness, the city had the right idea by installing the bike racks on Fayetteville Street, but these racks are not big enough for all of the riders in the area. We need more racks and, more importantly, we need to start paving roads wide enough to include bicycle lanes so that cyclists don’t have to worry about getting run off the road by impatient Triangle drivers. I ride a scooter instead of my bike to work because biking downtown during the week can be downright dangerous; at least on the scooter I can keep up with traffic. Great article. 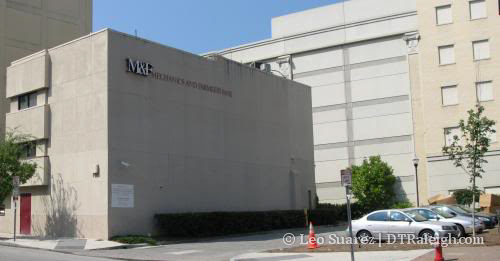 But I wanted to mention that buying the parking lot next to the M&F bank for bike parking would likely make it the most expensive bike parking spaces on the east coast. Maybe we could get a bike station at the new multimodal center when it’s built to offer parking, rentals, repairs and retail accessories. Either way, we need more bike racks that are immediately in front of buildings (so you don’t have to walk to a bike parking deck) and the city is currently identifying locations for exactly that. Thanks again for this article.